From butchers and bakers to candlestick makers, arthritis Cumberland is a village teeming with creative talent. It may be village of only 3, medical 000 inhabitants, but Cumberland is famed for its wide variety of artisans. Nicole Partridge of Nicole Partridge Jewelry has been a resident of Cumberland for almost a decade. Two years ago she decided to turn her jewelry making hobby into a serious business, and since then her beautiful, timeless jewelry has become well known throughout the Valley and even around the world. Partridge, 33, clearly remembers the first time she sold her jewelry. She was only 10 years old and it was at a meeting her mother was hosting in their home. Partridge asked if after the meeting she could set up a table to sell her jewelry creations to her mother’s friends. Her mom agreed and Partridge set up her display of pieces made from mouldable plastic. “There were brooches that looked like small pieces of satin bunched up and hardened and also metallic looking geometric shapes—it was in the 80s,” says Partridge. The response was more than Partridge or her mom expected—she made a cool $100 that night. Partridge tried other creative pursuits as she got older. She dabbled in painting. She also studied interior design in college. However, nothing gave her as much satisfaction as making jewelry. After her second son was born, she decided that she wanted to try selling her jewelry pieces again. With the help of her husband, Mark, Nicole created a small studio in a seven-by-twenty-foot walk-in closet that once served as a baby nursery. Though Partridge’s first artistic medium was moldable plastic, she has come a long way from that humble beginning. Today she uses sterling silver, gold and gemstones to create her pieces, including earrings, necklaces, bracelets and more. She is also drawn to gemstones. “I love the colors of the gemstones and the way the gold or silver enhances the beauty of each unique stone,” she says. She uses many interesting gemstones, such as black hematite, lapis lazuli, fluorite, green quartz, swiss blue topaz, aqua calcedony, and labradorite, which comes from Paul’s Island in Labrador. She is inspired by many things when she is looking for ideas for new pieces. One day she was inspired by the wheels on her son’s toy truck, and another day she was inspired by a stick insect she saw on a nature program. She now manages a Facebook page, a blog and a website. This includes doing her own photography for the sites. “The photography can be very challenging,” Partridge says. “The light has to be just right to get photos that work well on the websites.” She has also taught herself search engine optimization to get the most from her sites. “I’ve spent a lot of time on that, but it’s really worth the time in the end.” For example, she remembers one woman in Ireland who was searching for a very specific necklace. The woman typed in the particular gem and metal she was looking for and Partridge’s site came up—showing the exact necklace she was hoping to find. Even her kids help out. She laughs when she describes how her eldest son will wear her clip on earrings for a few hours to make sure they’re comfortable. When asked about the future of her business, Partridge says she’d like to see her creations sold at more places in BC and maybe even outside of the province. She’d also like to spend more time on her business, though she knows her time now is best spent raising her young family. “I only work 20 hours a week right now, but hopefully, in a few years I’ll be able to make it a full time venture.” In the meantime, she will continue to create unique jewelry that brings more bling to our Valley… and beyond. Locally, Partridge’s jewelry can be found at Cody and Company, Be Clothing, South Hollow Gallery, and the Kingfisher Resort. For more information visit www.nicolejewellery.com or find her on Facebook at www.facebook.com/nicolepartridgejewellery. downtown outside of Laughing Oyster Books, one of many local Safe Harbours. In the eyes of the law, all Canadians are not only equal in terms of legal rights, the implication is that they are entitled to be treated equally. Rights aside, however, only the naïve would believe that we all, in our diversity, are always treated equally. And it is to address that dichotomy of treatment that the Safe Harbour: Respect for All was created to address. We might think equal treatment for all is not only a reflection of human decency; it would seem to make sound business sense. And obviously it does. 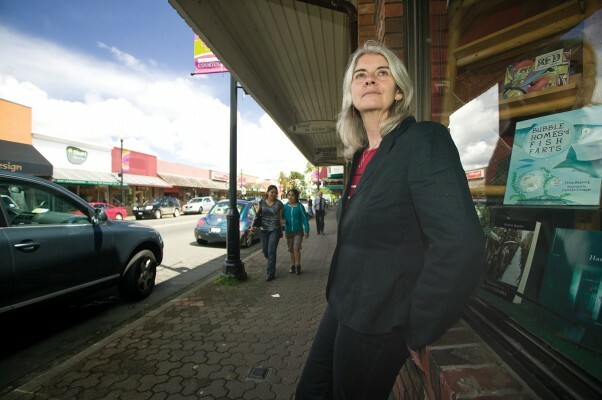 “In a nutshell, Safe Harbour is designed to raise awareness that diverse people could benefit from customized service,” says Kathie Landry, community organizer of the program through Creative Employment Access Society in Courtenay. 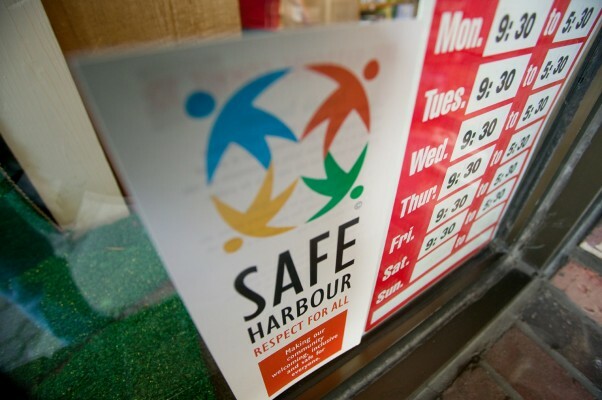 Started in Nanaimo in 2004, the Safe Harbour program is not only to be found in the Comox Valley (since 2008) but has spread nationally to Alberta, Manitoba and Newfoundland, with more than 1,000 Safe Harbor certified locations throughout the country. Is there a need for such a program in our community? Landry says that while the Comox Valley is indeed a tolerant and accepting community for the most part, there have been incidents that indicate that it is not paradise for ‘all’, even in this community. Those in the majority have probably never noticed any lack of fairness because they haven’t been impacted by it. But, witness the realities faced by another group. According to Statistics Canada, some 36 per cent of our visible minorities have experienced unfair treatment or discrimination due to their ethnicity, race, skin color, language or religion. Indeed, Landry takes it a step further and notes there have been, for example, moments of unpleasantness experienced in this community due to an individual’s lifestyle choices, sexuality, or such esoterica as piercings or hair coloration. Specifically to the point, what a Safe Harbour designation for a business means is that the business in question has signed onto three criteria. The first one is that the business designated as a Safe Harbour offers equitable service to all people, and equitable accommodation to all people. To qualify for a Safe Harbour designation, staff and management of the applying business must take a three-hour workshop designed to help people recognize we all have biases, says Landry. And our behaviors are affected by our biases. While the first commitment in receiving a Safe Harbour designation is for a business or service to provide equitable service to all people, the second commitment (of three) calls for the provision of an immediate safe place, a haven, for somebody who has been threatened on the streets. It’s a response to an immediate crisis. “The business will then assist the victim in finding the help he or she needs, whether it’s the police or possibly even medical attention,” Landry says. The third criterion is that all employees of a business are prepared to follow the mandate of Safe Harbor. “All staff must be aware and will be prepared to do anything they can to create a more welcoming facility,” Landry says. Upon completion of the workshop, participants receive the Safe Harbor: Respect for All window decal, a certificate and promotional materials to display as visible markers of their commitments to respect for all newcomers to the country and to this community, as well as Aboriginal people, youth, lesbian, gay, bisexual and transgender communities and other diverse groups. Those falling into one or more of those categories can rely on Safe Harbor as a symbol of trust in their neighborhoods. Those seeking a Safe Harbor designation do not need to look too far in the Comox Valley. Some 55 locations bear the logo, including the Comox Valley Airport, the Lewis Centre, North Island College, the Cumberland, Hornby Island and Bowser Credit Unions, Laughing Oyster Books, Zocalo Café, House of Color, and Safeway, which provides a haven from the elements for the homeless in times of bad weather. Also sporting the Safe Harbour designation are assorted social service locales, 12 schools and the school board office for District 71. Businesses and organizations seeking more information on the program or wanting to arrange for involvement in the workshop, please contact Kathie Landry with Creative Employment Access Society at 250-334-3119 or visit www.amssa.org/programs/diversity/safe-harbour.